siko_md, I thought of you when I saw this. It's called "The Uno". How would you keep from falling over? Can you imagine the kick stand it needs?!? It's probably hanging from the ceiling? Or stored in a padded box. Or you need valets to help you start it. I actually know the answer to this, sort of. 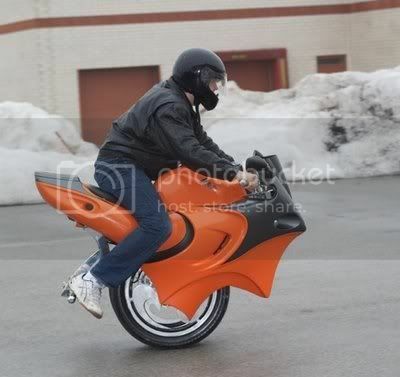 It actually has two wheels - next to each other and a gyroscope that keeps it upright (think Segway only faster). It speeds up and slows down following the way the rider leans backwards and forwards. I have not reaf how it turns, though. It still boggles the mind. I swear there will be many accidents with thisthing on the road, probably from the people around it going "wtf?!" and driving off the road. Ahahaha! Crashing saying "WTF!?!" is right! The gyroscope theory makes sense to me. There were other 'unicycle' creation in the same post where the rider sat inside a ginormous single tire and bombed around like that! We can come up with stupid pointless contraptions like these but we can't solve world hunger. //good to see you L!!! OK, that's scarier than the high heel shoe without the high heel. Eeep! Weren't some of those shoes traumatizing!! !